Patrice Pellerin is not only one of today’s greatest realist illustrators, but also an excellent writer of serials. The evidence is provided by this unusual album, which forms part of the series while also being very different. 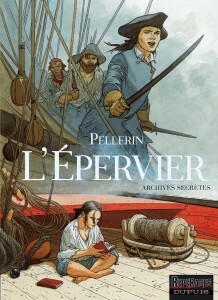 The adventures of Patrice Pellerin’s character Yann de Kermeur are already known to readers of the ‘l’Épervier’ series. A talented storyteller, Pellerin draws on his fertile imagination to dream up the main episodes of the hero’s life and their attendant mysteries. Here, he creates his character’s complete life story (in a genuine historic setting with which he plays a little), discovering what are supposedly the archives which record it – incompletely, since some parts have been lost or destroyed. Using this fragmentary outline of Yann’s life, he reveals his character’s innermost being: his sorrows and joys, his childhood and family, his first explorations of life and the ocean, the lure of deep-sea voyages and Guyana, his meeting with the pirates, and the situations where he diced with death.